The first free public bicycle pumps were installed in South Gloucestershire today (Thursday 10 June). Two new pumps have been installed on the popular Bristol and Bath Railway Path, with one situated in Bitton and the other in Warmley. These heavy duty public bicycle pumps provide cyclists with a convenient facility to pump up deflated tyres. The pumps are permanent fixtures, bolted to the ground and are suitable for both types of tyre valve and have a handy gauge to check pressure. They feature a robust stainless steel pump handle and an armoured air hose, and have been designed to withstand constant use. Two local organisations – Avon Valley Railway and Webbs of Warmley have kindly volunteered to look after the pumps and carry out routine maintenance, for example by replacing pump heads where necessary. 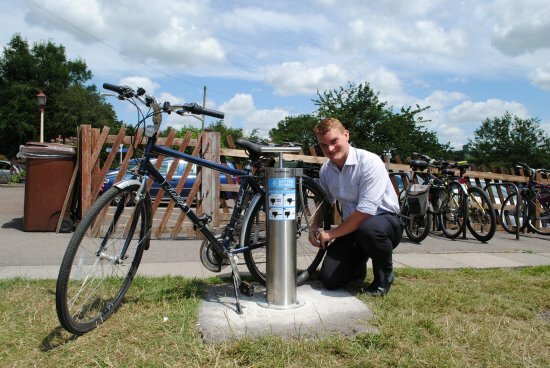 The new free bicycle pumps are available as part of a drive to make the West of England region cycle-friendly and improve safety for cyclists and have been funded by the Local Sustainable Transport Fund (LSTF).